Yehudit bat Merari (c. 2nd century BCE) was a Jewish woman who lived in the town of Bethulia in Israel. Her husband, Menashe, fought and died with the Maccabees during the Chanukah wars against the Syrian-Greeks. When a massive Greek legion led by General Holofernes invaded her village, the local men were too frightened to fight back. Taking matters into her own hands, the young widow (together with her maid) crossed enemy lines and pretended to be a Greek spy. Slowly, she got closer to the Greek authorities and eventually made it to the tent of Holofernes. One night, Judith plied him with wine and fed him cheese until he was asleep. She then decapitated him with his own sword. 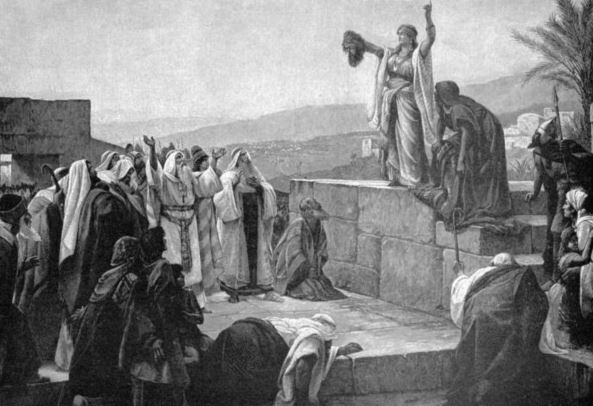 Judith brought the head back to the fearful Israelites and roused them to attack the Greeks. Her inspirational words and wise military counsel led to a monumental Jewish victory. Jewish texts credit this event as the turning point of the war, leading to the recapture and re-dedication of the Holy Temple, the preservation of Judaism, and the ultimate collapse of the Syrian-Greek empire. Judith is often listed as one of the genuine prophetesses of Israel, and a great heroine like Esther, Deborah, Yael, and many others before her. (She was even canonized as a saint in Catholicism!) In honour of her feat, it is customary to eat dairy products during the 8-day festival of Chanukah, and for women to abstain from any work while the Chanukah lights are burning. Judith continued to lead the nation until her passing at the age of 105. Chanukah Begins Saturday Night! Chag Sameach! The darkest time of the night is just before dawn. This entry was posted in Law, Politics & Military, Religious Leaders and tagged Chanukah, Greeks, Heroine, Holy Temple, Israel, Judith, Maccabee, Prophetess, Saint on December 21, 2016 by Jew of the Week. 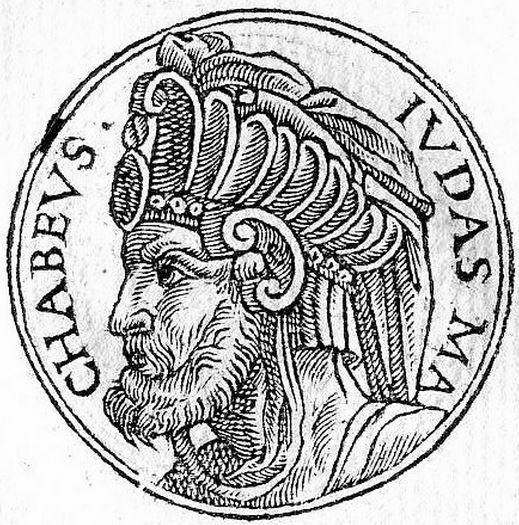 In 166 BCE, after the passing of Matityahu – the Jewish priest (kohen) who instigated the revolt against the Seleucid Greeks – his third son Yehuda (Judah) was chosen as the new leader of the resistance. By this time, Yehuda had made a name for himself as a fearless warrior and skilled military strategist. Nicknamed HaMakabi, “the hammer” (or alternatively, Makab-Yahu, “the one designated by God”), he continued to win battle after battle primarily through guerrilla tactics and surprise attacks. In 164 BCE, Yehuda recaptured Jerusalem and the Temple, re-purifying it, restoring its holy Jewish rituals, and relighting its menorah. Contrary to popular belief, the war did not end at that point. Two years later, Matityahu’s fourth son Eleazar died at the Battle of Beit Zechariah. Identifying what he thought was the war elephant carrying the Greek king, Eleazar slid under it and thrust his spear into its flesh. The dead elephant collapsed unto Eleazar, killing him as well. Perhaps the most pious of the sons, Eleazar was known to publicly read from the Torah before battle. 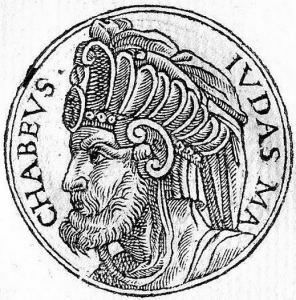 To gain support, in 161 BCE Yehuda signed an alliance with the Roman Empire, though it helped little. A year later, Yehuda died at the Battle of Elasa. His oldest brother Yochanan (John), of whom the least is known, died shortly after in the ensuing troubles. The youngest son Yonatan (Jonathan) was elected the new leader, by now earning a reputation almost equal to that of Yehuda. He continued the victories against the Greeks, and soon after signed a peace treaty with them. The Greeks left the Holy Land, and Yonatan focused his efforts on rebuilding the state, and removing Greek influences and idolatry from the land. In 153 BCE, a civil war erupted among the Greeks, and Yonatan sided with the winning party. He was given the special Greek title of “strategos”, and appointed as the High Priest (kohen gadol). Yonatan was able to further expand the territories of the semi-autonomous Jewish state. Years later, a different Greek king rose to power, and tricked Yonatan into a fatal trap, imprisoning, and then killing him. The last remaining son of Matityahu was Shimon (Simon), who gathered his forces in response to Yonatan’s death, and helped another Greek king come to power. This king then granted Judea its independence, and Shimon established the Hashmonean dynasty which would rule the Holy Land for the next century. Shimon was its first king and High Priest, reigning for five years of peace and prosperity. Tragically, he was assassinated in 135 BCE. His third son John Hyrcanus took power, continuing the Hashmonean dynasty until its ultimate end at the hands of the Romans. A person should always be pliant as a reed, and let him never be unyielding as the cedar. This entry was posted in Law, Politics & Military, Religious Leaders and tagged Chanukah, Greeks, Hashmonean, High Priest, Israel, Jerusalem, Kohen, Maccabee, Menorah, Seleucid, Strategos, Temple on December 16, 2014 by Jew of the Week.